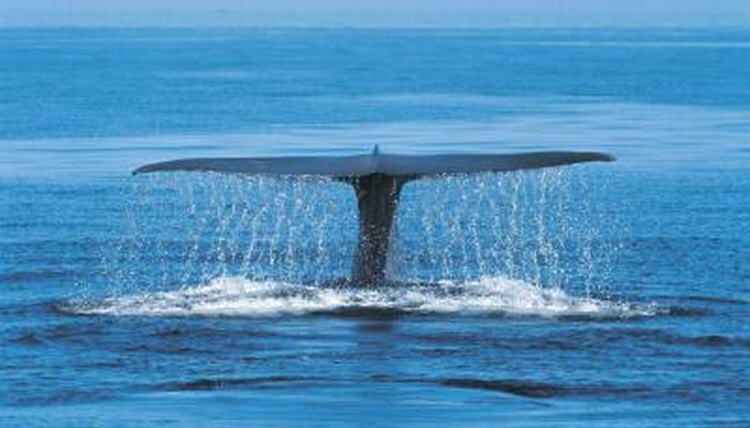 The blue whale (Balaenoptera musculus) is big -- in fact, it is the largest animal ever known on Earth. It is so large, at 200 tons and more than 100 feet long, that if it lived on land, it would be crushed by its own weight. Interestingly, it reaches those massive proportions eating nothing krill -- which it consumes at the rate of almost 4 tons per day. A whale’s eye is actually not small when compared to the eyeball of other animals, but for the whale’s size, it is disproportionate. An eyeball the size of a grapefruit on average seems large. However, if you put a grapefruit next to a 10-story building -- which is about as high as a blue whale is long -- you can see how the whale’s eye seems small compared to its body. Whale eyes are not only relatively small, but they are different from many animals in other ways. Whale eyes lack eyelashes and they do not come equipped with tear ducts. When you live in saltwater, eyelashes and tears -- adaptations for keeping out dirt and moistening the eyes -- are no longer essential. Whales depend primarily on the sense of sound in their natural habitat and so don’t really need to have good vision. At the depths in which they live, the water is so dark that vision serves little purpose, and only hearing is really necessary for navigation. A whale’s ear is not on the outside of the body where it would make him less stream-lined and interfere with swimming, but on the inside. Whales communicate through vibrations in the bones of their sinus cavities and can “speak” to one another at great distances through low frequency sound. Blue whales may be found in every ocean of the world, though their numbers are much reduced from historic highs, and they are currently on the endangered species list. For an animal so well-adapted to life in the ocean's depth, blue whales have interesting relatives on land. Of all terrestrial animals, the hippopotamus is the blue whale’s closest kin. Studies of the mitochondrial DNA from both show that they are sister groups and seem to indicate that whales and all other sea mammals originated from the ancestors of hippos and their land kin the pigs, giraffes and cows -- among others in the artiodactyl group. Bioweb: Anatomical Adaptations: A Mammal? In the Oceans?